Dragon boat festival is coming around the corner, exactly falling on this weekend this year. 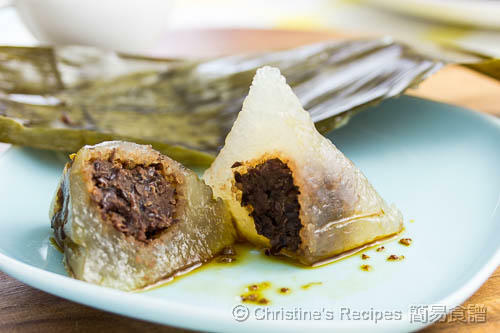 We will surely have some traditional savoury Cantonese sticky rice dumplings. As I was itching to make some sweet ones for my family as well. I soaked some sago for a little while, then wrapped in with red bean filling. Voila, the steamed sago dumplings looked so spectacular and went so well with the fragrant Osmanthus syrup. Immediately I brought a batch for a family gathering. And it’s gone so fast. The second batch is reserved as afternoon snack on the weekend. Cover sago with water and soak for about 30 minutes. Drain well. Mix with sugar and oil. Set aside. Divide red bean paste into 10 portions, each 25 grams. Knead each into a small ball. In a small sauce pan, place palm sugar and water. Cook over medium heat until the sugar completely dissolved. Remove from heat. Sprinkle dried Osmanthus flower and steep in the syrup, covered, until it’s cooled down. 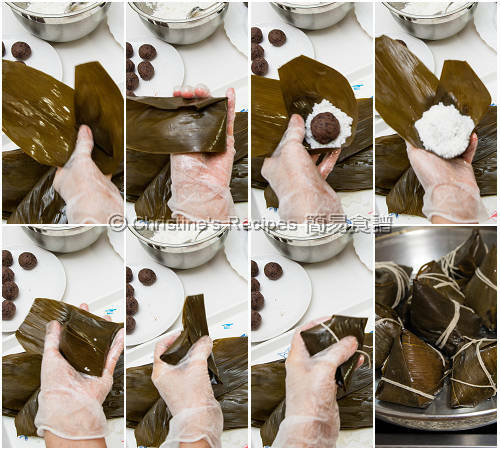 To wrap dumplings: With smooth side up, fold up 1/3 of a bamboo leaf to form a cone. Add 2 tablespoons of sago. Place a red bean ball in the middle, then top with another 2 tablespoons of sago to cover. Lightly press and level the surface. Fold the upper part of the leaf to cover the sago. Fold-in both sides and the remaining part. Form a triangle shape. Use kitchen twine to wrap tightly around the dumpling. Repeat this step to finish wrapping the remaining ingredients. Steam the dumplings in a wok or a steamer over high heat for about 30 minutes. When they cool down a bit, unwrap the dumplings. Serve warm with drizzled syrup. 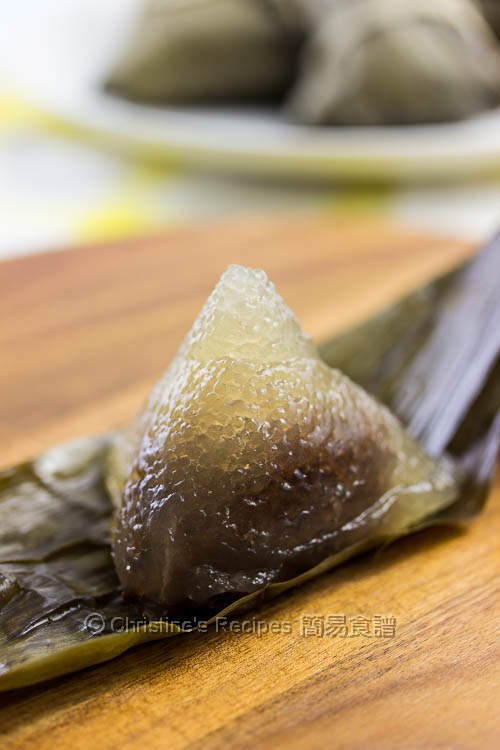 While the sago dumplings are still hot or warm, they look beautifully translucent. The leftovers can be chilled in fridge for about 1 week in an air-tight container. They turn opaque when cold. You can reheat them by steaming. The dumplings will turn soft and translucent again. Dried Osmanthus flower has a sweet, fragrant and refreshing smell, often used to make Chinese tea, available at Asian grocers. Or you may get it online here. You might like to discard the dried flowers after steeping in syrup or reserve them as decoration. This is so interesting! I have never thought of using sago to make dumplings. Wish I could taste one! This is something new to me. I can tell it s good. Wow, what a fantastic idea... but sadly I don't know how to wrap dumplings. Wonderful clicks! 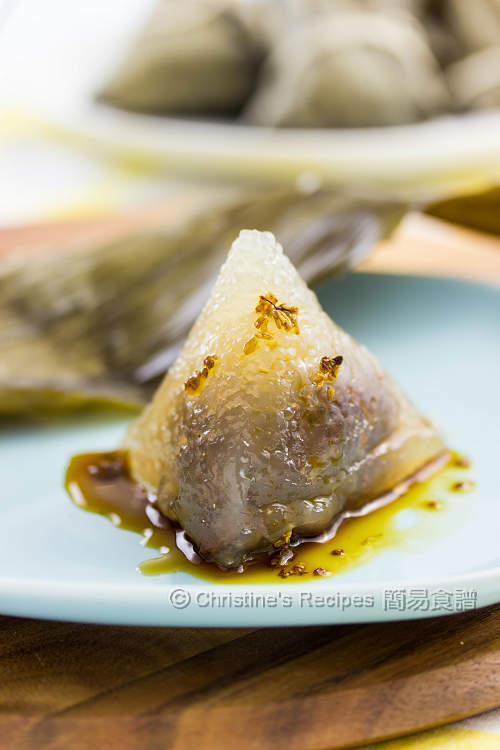 Do you have a video showing the wrapping of dumpling? Sorry, I didn't take video this time. Might do it next time. Thanks for your recipe sharing. It can be kept in fridge for up to a week. The texture of sago depends on how long you cook. If they are over-cooked, they'll turn mushy. Can you make this without the bamboo leaves? I think you can do it without bamboo leaves. Might use a mould or anything else. Be creative. You need to do some trial-and-error experiments though. Can I use air pressure cooker to steam? If yes, how many minutes do I use. Thank you. I made Sago Dumplings with Mung Bean Filling yesterday. The texture is taste but unfortunately the outlook is ugly. I fail as some of the sago and also filling burst out from the bamboo leaves after complete steaming. I tried making 2 separate batches but both of the same issue. Attempt using low fire for the second batch but still didn't manage to succeed. Another thing is that I use coconut oil instead of normal oil to add into the sago. 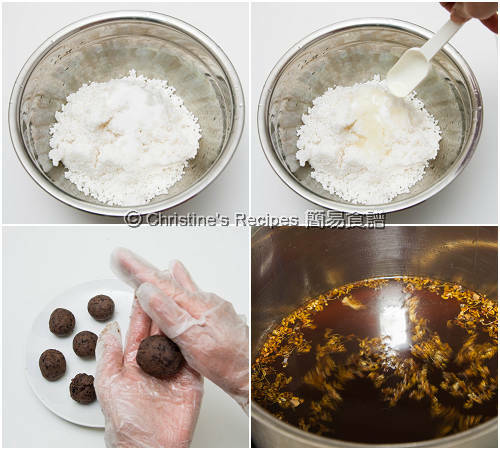 But receive feedback the is one smell but I not sure is it cause due to the coconut oil. I made the Sago Dumpling with Mung Bean paste fillings on last Sunday. However, not too successful as the sago and also the mung mean paste filling will flow out from the bamboo leave even though I didn't wrap too tight as understand sago will expand during steaming. I used organic coconut oil instead of normal oil to add into the sago but feedback is there is a funny aroma. Think organic coconut oil doesn't bland with sago. Therefore, hope you can guide me where went wrong as the overall outlook is not presentable. Yes, wrapping sago dumplings is a bit challenging. It's good for you to know that sago will expand so much. You didn't warp the dumplings too tight. You're on the right track already. Other than that, I'd recommend you may soak the sago in water long enough and let them absorb enough water before wrapping. I'd help a lot. Organic coconut oil has a mild smell itself. Some people can't accept it. Do you have any purified or deodorised coconut oil products available around your area? That kinds of coconut oil has gone through a steaming procedure to remove the funny smell. Or simply use other type of oil without any aroma.